Denmark Hill railway station is in the area of Denmark Hill in south London, England, on the Thameslink, South London, Greenwich Park and Chatham lines. It is 4 miles 22 chains (6.9 km) down the line from London Victoria. The station was built between 1864 and 1866. Its design by Charles Henry Driver is in the Italianate style, with an extremely decorative frontage and French pavilion roofs. In 1920 the waiting room was used by The Mystical Church of the Comforter, founded by Mrs Elizabeth Mary Eagle Skinner, who was known as “The Messenger”. The waiting room was transformed by an altar, painted white and surrounded by the seven colours of the rainbow. The Nottingham Evening Post for 17 June 1926 reported that babies were baptised, funeral services were read and even a marriage was solemnised. The porters and clerks of the railway company often worked to the accompaniment of hymns sung by the congregation. The church is believed to have ceased to function after the death of Mrs Skinner in November 1929. By the late 1970s the building had been neglected. In March 1980, arsonists broke into the booking hall and the resulting fire destroyed the roof. Initial work by British Rail engineers to make the building safe by demolishing parts of the remaining building triggered a protest campaign by the Camberwell Society. Following a joint initiative between them, the Southwark Environment Trust and the British Rail Director of the Environment, Bernard Kaukas, the building was restored in 1985 at a cost of £300,000 (equivalent to £890,000 in 2018). The project included the addition of a public house, initially called the Phoenix and Firkin to commemorate the fire, then called O'Neills and now the Phoenix. The building was given a Civic Trust award in 2009. In the period 2011–2013 the station underwent a redesign with the construction of a new ticket office with access from Champion Park, new walkways and lifts to the platforms. On 14 December 2014, flames were spotted underneath a Southeastern train travelling from Victoria to Dartford as it approached Denmark Hill Station. The platforms are below road level, with the short Grove Tunnel at one end and Denmark Hill road bridge at the other. The station is managed by Thameslink and is served by trains of that company, Southeastern, and London Overground. It is in Travelcard Zone 2. It is on Champion Park in the south of Camberwell. 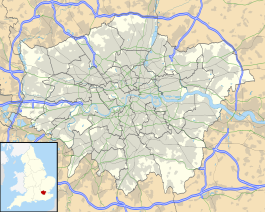 It is near to King's College and Maudsley hospitals and to the Denmark Hill campus of King's College London, whose buildings are intermingled around and between the two hospitals. It is mostly served by local trains on the London Overground and trains from two London termini: Victoria and Blackfriars. London Buses routes 40, 176, 185 and 484 serve the station. ^ "Work starts to improve access at Denmark Hill station". Global Rail News. RailStaff Publications Limited. 26 May 2011. Retrieved 16 August 2017. ^ "Denmark Hill station shut after fire underneath train". BBC News. 4 December 2014. Retrieved 16 August 2016. Wikimedia Commons has media related to Denmark Hill railway station.